May I ask if you are running Windows 8, 8.1 or Windows 10? Windows 8, & 8.1, and Windows 10,will automatically disable Windows Defender. It will not allow you to have both enabled at the same time. This is a function of Windows, not Webroot. The same will be true of any AV you install on Windows on these systems. If you uninstall Webroot (or other AV you have installed) Windows Defender will automatically come back active if it was set for that, OR it will provide you a system notification that action is needed in order to either turn Windows Defender back on or re-enable/re-install your other AV. In short.. with another AV installed and active, you can't enable Windows Defender, but it will be there if the other AV is turned off or uninstalled. First of all, Thank You su much! I dont speak English, so I'll do my best I am with 8.1. Do you know the company My System Fix ? They call me 3 times (since Feb. 14) and every time I pay a lot of money...over $750.00 american money...I'm in Quebec Canada. I am stupid....I realize now. The last time, he said: You need Windows Defender...Driver updated. PUAs are very annoying at best in that they cause pop-ups, redirect your browser home page, and other behaviour that may slow down the computer and direct ads your way, but they are not actually doing anything bad like damaging files or stealing information. Often they are installed intentionally by you the user as browser add-ons for various tasks such as quick search tools. But they also come with the result of added annoying pop-ups and ads. Other times they 'piggy back' with other software that you installed, or try to 'sneak' onto your system entirely. The key to avoiding them is to make sure that when downloading apps one does so from the author's own website or one that they have recommended, and not 3rd party downloading site. WSA does detect and remove many PUA's, and more are being added, but WSA does not detect all of them. A simple browser add-on with PUA behaviour that is easy to identify and easy to remove is not likely to be detected and removed by WSA. Those that are intentionally difficult to locate and remove are. Please see THIS LINK for more information regarding Webroot's stance on these annoying programs. Run another scan with Webroot and remove any items that get detected. If that does not helps and you feel or consider yourself technically proficient then you can try these steps to remove it from your system. And if that does not work or you do not feel technically capable then the best thing to do is to Open a Support Ticket & ask Webroot Support to take a look and remove these for you. There is NO CHARGE for this for valid WSA license holder. I am so sorry about this! Webroot gives free Webroot Support anytime you need it with a WEbroot susbscription if you are having issues concerning Webroot or even running Windows Defender. This sounds surely to be a scam. If there is any way to get yoyur money back if you paid with a credit card I would try to do so. I would also Submit a Support Ticket and see if your system has not been compromised. 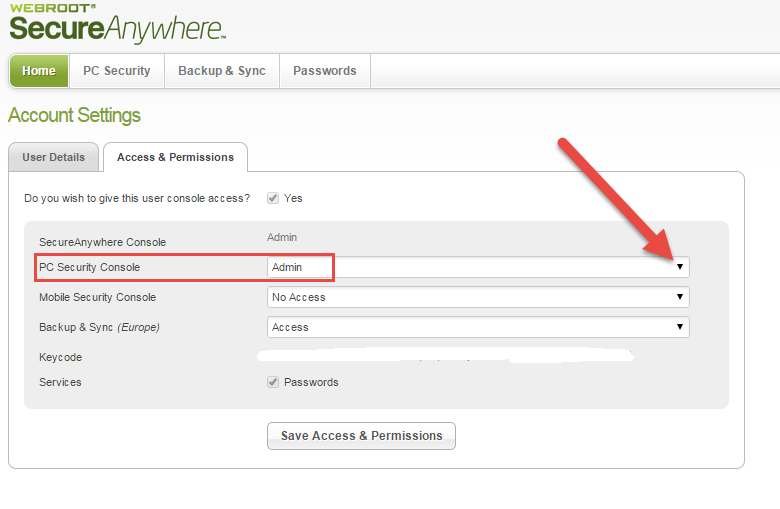 I try with Webroot and when I click on Unselecte Defect Potentially Unwanted Application, a message Appear=SecureAnywhere est géré par la console Web. Toutes les notifications doivent être appliquées en un point central. Reportez-vous à la documentation de SecureAnywhere pour plus d'informations. So, I'm not a technician ...I need HELP I dont want to do something wrong.
? You speak french don't you? I dont thing I can have a refund for that lot of money. I paid by Credit Card. And now, what is the best for me? You could always call the credit card in question and tell them that this was a scam and you'd like to see if you can get a refund from this company. And they would let you know if this was possible. I would Submit a Support Ticket and they wil check your system out for you . 1. Connectez-vous à votre console web (ICI) , et une fois connecté dans le panneau principal, cliquez sur votre adresse e-mail situé dans le coin supérieur droit du panneau . 2. Sélectionnez « Paramètres du compte », dans le menu déroulant présenté . 3. Dans les sections « Accès et autorisations » de la page affichée localiser les options du « PC Security » et vérifier pour voir ce que le niveau d'accès est ... pour ce que vous cherchez , il devrait dire 'Admin' . Encore une fois , sélectionnez la flèche du menu déroulant à droite du champ d'état contre la « Security Console PC ' et dans la liste affichée , sélectionnez ' Admin ' . 5. Cliquez sur 'Enregistrer accès et autorisations », qui devrait vous ramener à la page « Paramètres du compte ». 6. De là, cliquez sur l'onglet « PC Security » dans l'en-tête , ce qui devrait vous montrer les dispositifs de PC que vous avez protégés par WSA . Si vous cliquez sur le PC concerné, vous devriez maintenant voir l'onglet « Commandes » montrant en haut de la pop up , à côté de 'A propos' & ' information Scan. Une fois que vous avez réussi à résoudre le ci-dessus si vous accédez à la console Web et sous ' PC Security ' , cliquez sur ' Aller a PC Security' , vous devriez être redirigé vers une page qui montre tous les PC que vous avez enregistrés / sont protégés par WSA . Cliquez sur l'icône pour celui ou ceux ( à son tour ) que vous êtes intéressé à changer le réglage et qui devrait afficher un panneau contextuel tête avec trois options ; A propos , Information Scan & Commandes. Assurez-vous que 'A propos est sélectionné , puis regarder le bas du panneau . Là, vous devriez voir ' Configuration utilisateur ' avec ' ( Edit ) ' à côté de lui . Si vous cliquez sur modifier vous avez accès à un menu déroulant qui vous permet de sélectionner la gestion locale entre autres options. Vous devez bien sûr de faire la même chose pour chaque ordinateur protégé que dans chaque cas, vous ne faites que le changement pour l'ordinateur sélectionné . Mes excuses, mais j'ai traduit l'anglais rapidement de sorte que certains des traductions peuvent ne pas être tout à fait correct ... juste poster en arrière s'il y a des zones qui ne sont pas claires à la suite. I can take little credit as I used Google Translate to get a rough translation and then just proof read that to make sure that there were no obvious funnies which one sometimes get when using such tools...I foudn a few and corrected them but in the final analysis we will have to wait for Katana to respond as to whether what I posted is (a) topical & (b) more importantly understandable to someone who is new to this. but lets wait for the OP to advise abck on whether it has been of any assistance. Put in your email address and password to your online Account Console. They will respond back to your email with a response within a day or so usually. Katana wanted me to say Thank you to all those who have helped her here. A support ticket was sent and I heard from Kantana saying that Support told her the Webroot that she purchased was by a 3rd party and that she has to go through them. Thanks Baldrick for the help! :D But of course Katana might just contact you anyways. eh? Thanks for the heads up. That would explain what was behind the message in French that she shared with us. Just hope that she manages to get the right support. Katana paid good money for this 3rd party company so I do hope that she will get the best support possible. You are most welcome. Yes please do keep us posted! We want to make sure you were taken care of!